In this virtual world that is the Internet, physical location often seems increasingly irrelevant. Today, however, on this day after Thanksgiving, 2011, my physical location is significant. It offers a poignant context for my thoughts. I’m sitting in a coffee shop, Green Bean Coffee Company, in Greensburg, Kansas. It’s at the corner of Main Street and Federal Highway 54 (http://www.notyourmommascoffee.com/). Greensburg was all but completely destroyed by a massive tornado in May, 2007. The entire business district was leveled. Every tree was completely denuded, with only trunks and major branches still standing. About 2/3 to 3/4 of the entire town of roughly 1200 people blew away. Among the buildings destroyed was the United Methodist Church. About a month after the tornado, I had the awesome (and I do mean awesome, literally) privilege and challenge of preaching on the site where the church building was. We met in a tent, on a corner of the property, using hymnbooks salvaged from the wreckage. There were about 50 people there, as I now recall it. Many of the church members were living elsewhere, since nearly everyone’s home had been destroyed, so the congregation was some diminished from what they generally knew. What would I have to say to people who had lost all their material possessions? One of the amazing facts about the tornado’s destructiveness is that so few people were injured and only one or two (again, going on faulty memory) died. Any death is tragic, but given the magnitude of this tornado, it’s truly a wonder that not more perished. Still, these dear folk were devastated. Yes, so, what would I have to say that might be of help? I didn’t have to worry. What I said was largely irrelevant. The people gathered in that tent were so thankful just to be together, just to have community intact though buildings were gone; thankful that so few had lost their lives; thankful that God’s presence was and is ever near and especially so now as they worked on cleaning up and rebuilding. I will never forget listening to them pray that day. Now, four years later, I am, for just a moment, back in Greensburg. I haven’t been here, I think, since moving to Texas and I am amazed at the changes. There is a new hospital, a new complex of school buildings, a new downtown (it looks like what suburban folk might think of as a smallish shopping area in their neighborhood), and lots of new houses. One still sees plenty of empty lots and naked foundations left over from the storm. I know this town has suffered many difficulties in rebuilding, including being scammed by dishonest “builders.” I cannot imagine all the challenges they have faced and I am confident there are more to come. But here I am, in a town that is rebuilding. I cry fairly easily, anyway, and when I pulled into town, I started. It is inspiring. 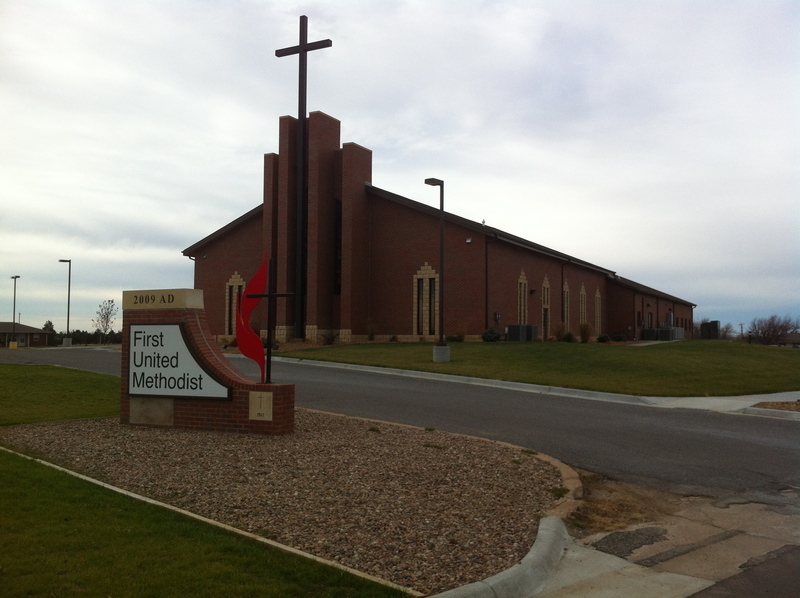 By the way, here’s a photo of the United Methodist Church that now stands on the same spot as before. And now for what Greensburg teaches me. I am deeply troubled by the gap between the biblical vision of the Christian life and the reality many of us (most?) experience. I have recently published on this matter and I have much more to attempt. ( If you’re interested, go to (https://wipfandstock.com/store/Aiming_at_Maturity_The_Goal_of_the_Christian_Life). I feel a parallel concern about church-related higher education, our UM colleges and universities. I love the academy. I love the church. But I have some bones to pick and I’ve started picking them. Stay tuned. Today, though, sitting in Greensburg, KS, I ponder what this town teaches. It does not matter how big the challenge is. God’s grace is sufficient. We can rebuild. And we can rebuild better than what we were and had. (Greensburg has received national attention because of its commitment to environmentally sustainable construction.) We can change. Yes, we can change. And the world – at least those parts of it where we live and work – will be better for our trying. I mentioned in the previous post my beef with the faux tolerance on college campuses. (I generalize without demeaning examples of real tolerance.) Desiring to think a bit more closely about what tolerance actually is, I hied myself to the trusty Oxford English Dictionary. For the verb “tolerate,” this part of the definition comes closest: “To bear without repugnance; to allow intellectually, or in taste, sentiment, or principle; to put up with.” The first infinitive caught my attention. What does it mean “to bear” something? Well, it means “to carry” it, which suggests that you have to come into close contact with it. Tolerating something, tolerating a person, assumes close contact and interaction. It also assumes some degree of discomfort with the bearing. A college campus – even a small one – is a big place. We can go about our business largely without having to interact seriously with ideological differences. We thus need not tolerate one another even when we’re in close proximity. We don’t have “to bear” anybody’s outrageous ideas because we don’t take the time seriously to engage them. Remember higher education’s stated mission and the problem comes into plain view. It is to help young people prepare intellectually and ethically for the (“adult”) world of ambiguities, difficulties, tragedies and hard choices. I worry that we largely fail on this aim. Why? Precisely because we do not sustain activities that challenge students to grapple courageously and sensitively with anything very troubling. Time for an example: as part of our 9/11 remembrances at the university where I work, we had a number of lectures, panel discussions and ceremonies. As chaplain, I participated on a panel dealing with religious diversity and the need to live with one another in peace. I believe deeply in the truth and goodness of this theme. As I studied this gathering, though we were somewhat ethnically and religiously diverse, we were, for all I could tell, ideologically the same. I speculate, of course, because I did not poll everyone in the room, but I did pay attention. Questions, comments and the general “vibe” in the room signaled virtual consensus on what the problems are and what we need to do to fix them. Thus, when fellow panel members said, in a couple of different ways, that religions all essentially work for the same ends, nobody questioned that claim (except me) and numerous heads nodded assent. When another panel member said that the reason for religion-related violence is ignorance and that we just “need to educate people,” again the general tenor of the room exhibited agreement. Except for me. I challenged the empty platitudes. I’m not painting myself as the hero. I was just trying to do what I think panel discussants are supposed to do. We are different. Let’s talk about our differences in a peaceful, even loving, way. No, we didn’t do that. Thus, we had no need for tolerance. I am talking about a very common problem on college campuses. We talk much about tolerance. We actually demonstrate it very little. We have events, we “engage” in “dialogue” and we all go home feeling good that we “tackled” some difficult topic. But there was no real debate. If anyone in the room disagrees, he/she/they stay silent. Only the boldest of contrarians speak their minds. This happens within the (college) environment that prides itself on upholding intellectual engagement, on being open and tolerant and courageously tackling the major issues of the day. We still need real tolerance. I recently had an encounter with a student who expressed irritation with “judgmental Christians” who tell people they are going to hell. This attitude is common on college campuses. Therefore, our brief conversation nicely illustrates how we are largely failing to grow thoughtful, self-aware young adults. To use academic speak: we are not teaching students how to think critically, even though we talk about critical thinking all the time. Dirty little secret: “thinking critically” often turns out to mean demonstrating agreement with the professor on tests and in papers. Students figure this one out quickly. I know that colleges and universities all have professors who don’t fit what I just said. They are careful, compassionate, pedagogues. But let’s not miss the forest for the trees. I don’t want to get sidetracked on the theology of this question. I know that thoughtful people disagree about people’s eternal destinies. And I am not one who thinks going around telling people they’re going to hell represents a good Christian witness. Rather, I want to look at the logical problem this student has. It became clear to me that the student could not recognize that her opinion was not self-evidently true. Merely making the assertion seemed sufficient to settle the matter. Again, I don’t have a problem with the view. I have a problem with the student’s inability to articulate reasons for thinking it superior to the one she was criticizing. In higher education, we are supposed to be in the business of helping students learn to think well. This is not all we’re supposed to do, but certainly it is one of our main jobs. We are to help students become self-aware and reflective about how they develop their opinions, where they get their ideas and how they support them. We are to give them the intellectual tools to evaluate well their own thinking. Then they’ll be able to fairly evaluate others’. But we do not teach them. Maybe we don’t have time. Maybe we don’t care. Good dialogue requires real tolerance and respect, not the mere mouthing of these words. For all our talk about tolerance (which I support wholeheartedly), I see precious little of it on college campuses. It’s more like we’ve declared a truce. We don’t, in fact, tolerate each other, we just co-exist in the same general space. We may call this arrangement “tolerance,” but it is a sham tolerance. We tacitly make a deal not to talk to each other about controversial things. Instead, we divide into self-selected groups and talk only to those who already agree with us. So, nobody has to think critically, not even the professors. To the extent that what I have said is true, to that extent we are failing to educate young people. God forgive us. Since when did watching people vomit become funny? I admit, I do not watch these TV shows, so maybe it was just a coincidence. Last week, I watched my first episode of “Campus PD” on one of the cable channels. I have known about the show for some time, but since I work with college students, I frankly could not bring myself to watch it. Last week I worked up the courage. A couple of days later, I happened on “Tosh.0” (I think is the name). Of course, with “Campus PD,” the viewers were regaled by a constant barrage of drunk college kids. In one scene, two young men are sitting, completely stupefied, on the curb (kerb, if you are an Anglophile) outside a hotel. Both of them have vomit between their feet. A couple of days later, I just happened to be passing by “Tosh.0” as I channel surfaced and witnessed another scene involving someone puking. This time it was a guy in the buddy position of a hang glider. Apparently, he wasn’t taking too well to the ride. The host, Mr. Tosh, played and replayed the emetic episode, clearly enjoying the man’s discomfort and the awkwardness of the moment. Do his viewers really enjoy this fare? I’ve seen similar things on “Jackass.” Please remember, I do not watch any of these shows. In each case, I happened upon them as I was passing on to somewhere else in Cable World. I thus conclude that, if I see this much vomiting on television in such brief moments, they must be happening quite a bit. And somebody must think it’s funny. Some of us who work in the university have been reading a book, lately: Getting Wasted, by sociologist and college professor Thomas Vander Venn. In describing the various kinds of motives and means of social support that college students give one another while engaging in binge drinking, he reflected on how students describe even being hung over together as “fun” or “a good time.” He also mentioned one study in which neophyte pot smokers had to learn how to enjoy the sensation of being high, then alluded to the same pedagogical principle at work among college drinkers. In other words, the “fun” associated with being drunk or high is in some significant ways, a learned behavior. You can learn that vomiting and passing out is actually fun. Hm. Most importantly, what we’re not noticing is the implicit moral community associated with such fun. In interviews with Vander Venn, students explained repeatedly that having fun and good times is supremely important, worth the risks and consequences of blackouts and alcohol poisoning. They actually experience a kind of community, through the “drunk support” (his term) and consequence management associated with college party scenes. Another way to notice the moral vision of this behavior: how often do we talk with students about peer pressure? What is peer pressure, but moral pressure? “It’s fun. Come on! Don’t be a loser!” We need to notice the moral tone, perverse as it seems. So, students believe that cutting loose, having fun, getting wasted, is a good. It is one that they fight to keep. They believe in the freedom associated with partying. They are in college. It is “their time.” Again, notice the moral vision. If you’d like to look at this matter in some detail, see Christian Smith, et. al., Lost in Transition: The Dark Side of Emerging Adulthood (Oxford University Press, 2011), especially the chapter, “Intoxication‘s Fake Feeling of Happiness.” It’s pretty sobering stuff.